J.R.R. Tolkien’s The Hobbit became an instant success when it was first published in 1937, and 75 years later Tolkien’s epic tale of elves, dwarves, trolls, goblins, myth, magic and adventure has lost none of its appeal. To commemorate this anniversary, HarperCollins is proud to present a facsimile edition of the first historic printing of The Hobbit. A must-have for any collector or fan! Bilbo Baggins enjoys a quiet and contented life, with no desire to travel far from the comforts of home; then one day the wizard Gandalf and a band of dwarves arrive unexpectedly and enlist his services – as a burglar. Bilbo’s life is never to be the same again. Perfect for gift giving, this is a beautiful hardcover pocket edition of The Hobbit, commemorating 75 years since the publication of this beloved book. For the first time in one volume, The History of the Hobbit presents the complete unpublished text of the original manuscript of J.R.R.Tolkien’s The Hobbit, accompanied by John Rateliff ’s lively and informative account of how the book came to be written and published. As well as recording the numerous changes made to the story both before and after publication, it examines – chapter-by-chapter – why those changes were made and how they reflect Tolkien’s ever-growing concept of Middle-earth. To celebrate the 75th Anniversary of the publication of The Hobbit, a sumptuous full colour art book containing the complete collection of more than one hundred Hobbit sketches, drawings, paintings and maps by J.R.R. Tolkien. This brand new full-colour art book reveals in sumptuous detail over 100 paintings based on The Lord of the Rings by acclaimed Dutch artist, Cor Blok, many of which appear here for the first time. Fifty years ago Cor Blok was captivated by the trilogy and this spark of enthusiasm led to the creation of over 100 paintings. A brand new edition of this long unavailable children’s story with newly scanned manuscript pages and redesigned text. Tolkien invented and illustrated the book of Mr Bliss’s adventures for his own children when they were very young. The story is reproduced here exactly as he created it – handwritten with lots of detailed and uproarious colour pictures. From correspondence with David Brawn at HarperCollins, I also have details of Tolkien eBooks for the next year. I am pleased to say that the eBooks will be published this year, with the two volumes of The Book of Lost Tales published in the next couple of weeks, to be followed at two-monthly intervals by the three Early Silmarillion volumes, then the four Lord of the Rings volumes, and finally the two Later Silmarillion and the Peoples of Middle-earth volumes in September. The complementary work, The History of The Hobbit, will follow as an ebook in October. Carpenter’s A Biography, together with John Garth’s Tolkien and the Great War, will be published as eBooks at the end of April, to coincide with new paperback editions of both works. We are planning to publish eBooks of Letters and the Hammond and Scull books early next year. Hi Sara. Many thanks for your post and for your clarifications. I'm happy to learn that my suggestion about the newspaper article being a "construction" (based on the journalist's own fantasies) was correct. One of the reason why I've asked critical posters not to base their opinion of your work on the newspaper article, is that I myself experienced something similar about twenty years ago. A couple of close friends in my hometown suddenly become national news in Sweden and were harassed by tabloid newspaper journalists. When I read some of the articles, it was obvious to an "insider" like me that the texts consisted of 5% fact and 95% pure speculation. Feel free to contact me at morgan[at]tolkienindex[dot]net. Thanks for posting that clarification aranel_parmadil! A great pity that substandard journalism has undermined something I put my heart and soul into. It is indeed a pity. It's perhaps even more of a pity, as Morgan has pointed out, that people don't err on the side of caution & assume that the article (& article author) may be in error & not yourself; particularly when there is so much evidence of this kind of thing online already. I had no idea I was getting such stick online for this article. Personally, I wouldn't even bother going to read half of it. The internet is full of garbage & the last thing you should waste your time doing is corrected & challenging ill-informed opinion & views --you'll be at it forever. Hi Sara, thanks for dropping by, and definitely welcome! The opinions I have seen online on this topic, have all been focused on the two 'journalists' in question, and not on you. Being in the USA it is not likely that I will run across your thesis in either of those libraries, but I am hoping that you are able to turn it into book form at some point so that I can purchase a copy. I know my Tolkien quotes. Goodness only knows where the journalist got it from. Sara, as some of this misinformation has come from your school's web site, the incorrect quote, incorrect spelling of Middle-earth and 'appalling' handwriting, you might want to ask them to remove or update the page. As I think we have already stated it is a shame that these things seem to go out of control on the internet. Hi Trotter. Yes, my school simply took the published article and put most of that on the website. I have asked them to amend it, but things obviously move slowly in our IT department. I will be reminding them! School website article has now been suitably amended. That's great news - well done! 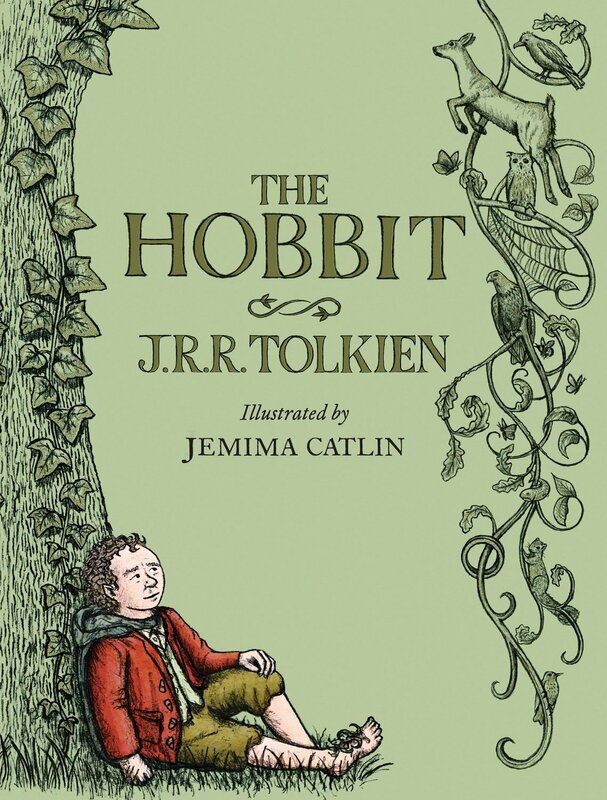 This is the cover of the new illustrated Hobbit with illustrations by Jemima Catlin, which I believe is scheduled to come out in September. Doesn't appeal at all, to be honest. Be interesting to see if the interior illustrations are more engaging. I've got to agree with Stu on this. Personally, I don't find it appealing. However, this design really looks like a conscious push by the publishers to draw young children to the book on the store shelves. It reminds me of many of the other modern children's covers out there. The classic Tolkien drawn Hobbit cover might not be "keeping up with the times" in the children's section at Barnes and Noble anymore. My kids are only 3 (obviously not the target audience), but I guarantee they would grab this one off the shelf before the classic cover. Looks like a touch of Pauline Baynes influence too, now that I think of it. - Just a touch.